Where was I? Ah yes. 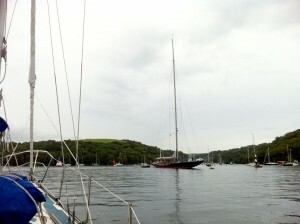 We motored much of the way from Salcombe, in an almost flat calm sea. Passing the entrance to The Yealm the wind picked up a little. By the time the Eddystone Rock Lighthouse looked a stone’s throw away (it wasn’t, unless you’re Trecobben or Cormelian), we could set both sails. Polhawn fort, the site of the first Not The Millennium Party and now mainly a wedding venue, was the last part of the huge expanse of Plymouth Harbour to slide past. 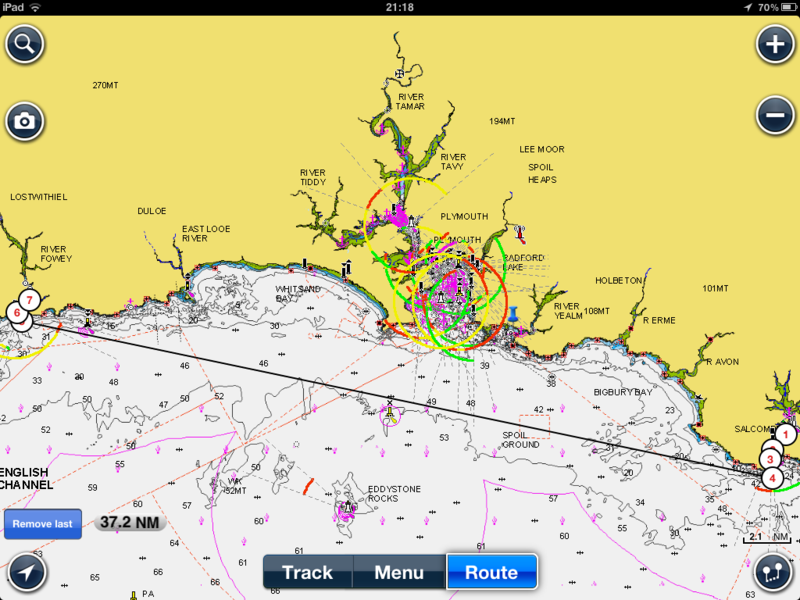 The last time I sailed here was watching the Total Solar Eclipse with Catherine, from a friend’s Nic 45 ‘Innisfree’, during our return to Haslar via the Isles of Scilly. We recall seeing the shoreline clearly defined and outlined by seemingly millions of pinpricks of far off flashbulbs, as totality sliced across the sea towards us. This time it was a more subdued affair, as the previously reliable Standard Horizon Chart Plotter (which had looked decidedly peaky earlier) flickered out. A quick wiggle of cables indicated that it wasn’t a power problem and, furthermore, the trickle of water which ran our of the card slot, upon turning it upside down, hinted at something more involved. That was nothing compared with the torrent which emerged when I finally plucked up courage to take it apart. The only surprising thing was how resilient it was not to have succumbed to a watery death earlier (although technically, it’s waterproof – I still have no idea how the water got in). We resorted to taking bearings, working out the magnetic deviation and compass variations. note: after a day warming its self on the engine the screen occasionally flickered into life once reconnected, rather hindered by the rusty capacitors, but still reliably giving the Standard Horizon GX2100 DSC radio a position, meaning we could again navigate from the chart table.. and display AIS targets on the radio (essentially some rather useful advance warning about the big ships about to run you down in fog). 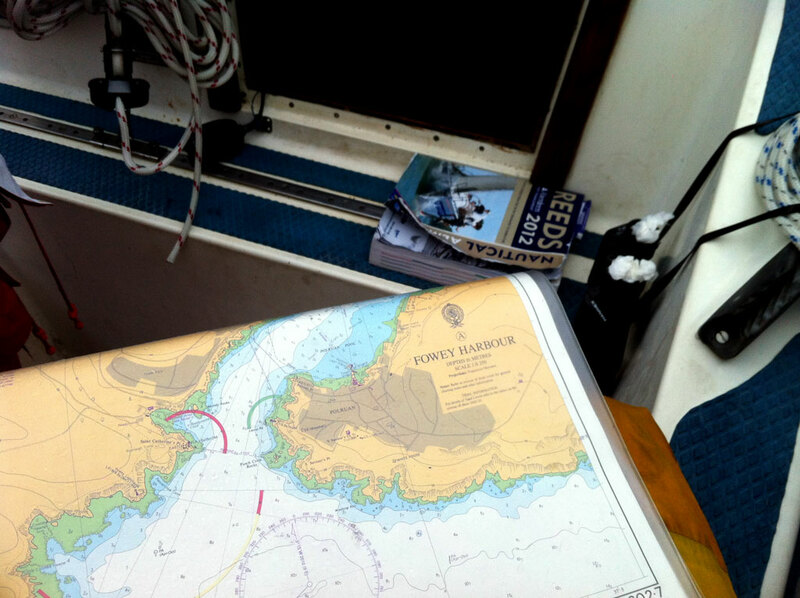 The breeze weakened after a short while so we furled the genoa and started the, now reliable*, donkey in order to avoid our continued game of marine-chicken with some pair trawlers who appeared to be chasing shoals of fish (or us) in unpredictable circles. 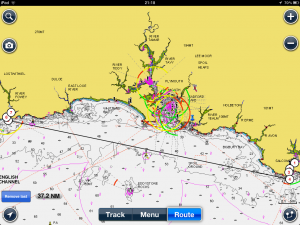 Finally, when somewhere between Looe and Polperro, we could discern our destination ahead: the huge Red and White victorian daymark ushering seafarers into the safety of Fowey’s deep harbour and shelter. *The engineer from SMS had visited around 9am and soon found a failing olive, replacing the copper pipe with rubber hose and changing the pre filter. It was a worthwhile exercise, considering the outcome, however we paid for the time taken to find, or make, parts which one could reasonably expect in stock at that rate (£240: £80 call out, 2 additional hours labour, parts and VAT). Still, this is boating, and it comes with the territory: I don’t particularly begrudge it. 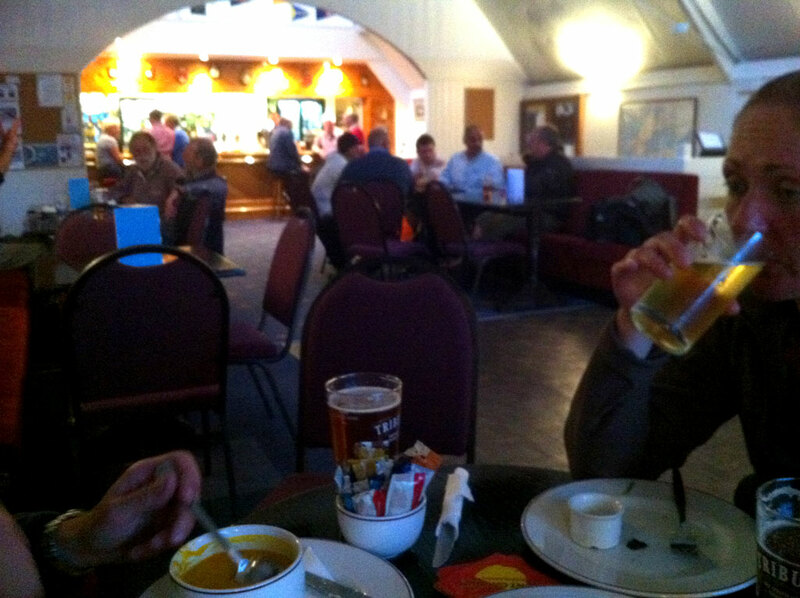 Anyway, nothing gets remotely near Ollie’s bar bill for a week (luckily, he’s a man of independent means when it comes to slaking thirst, otherwise we’d have rarely afforded to start the engine and it’d have taken significantly longer to get here in the first place, let alone without mutiny). Gradually, we became aware of a presence – a large UK Border Agency cutter, shadowing us, disguised by the cliffs inshore. It had crept up silently, grey as old ocean himself. This mysterious vessel maintained intimidatingly perfect speed and distance for quite some time, a large calibre gun meanacingly prominent on its foredeck. Eventually, it disgorged a RIB and we excitedly thought of adventure in the form of a boarding party. 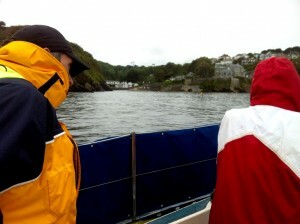 However, the RIB sped along the coast towards the now nearby entrance of Fowey. The Cutter smartly went about, gliding silently back to whence it came, presumably the military fastness of Devonport. 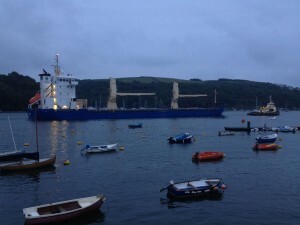 And so, in the gloaming, we chugged into the Fowey’s fairway as if it were night: guided by the reassurance of transits and the White and Green of the sector light; now in the company of some racing yachts returning home, limp spinnakers sagging in the failing wind like the breasts of sad, famine ravaged, mothers. 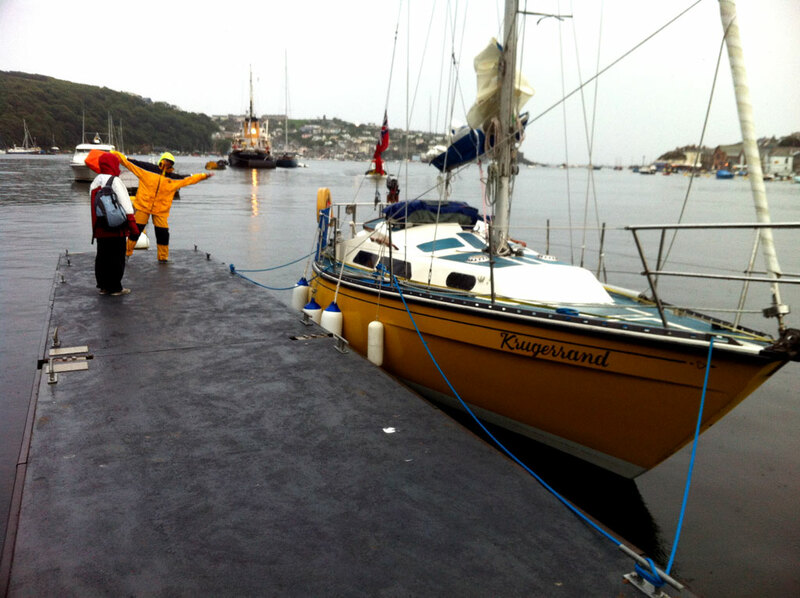 A Pontoon on Fowey, we’re in Cornwall! Inside, within the expanse of this deceptively compact and busy working harbour, was a sight we’d not expcected to see: the 130′ (40m) regal sweep and thrust of a J Class, with Black hull – not one I recognised but which we later discovered was the new Aluminium ‘Rainbow’: a replica of the original, scrapped in 1940 after successfully defending the Americas Cup (possibly the world’s oldest continuing sporting trophy) against Endeavour during her short life of only 6(!) years. 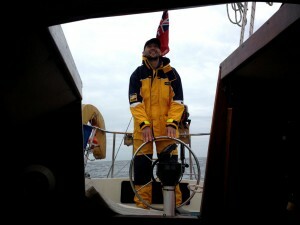 The Harbour Patrol (VHF ch12) directed us to the stern of a proper working ship: ‘Holland’. However, it seemed that even this large, robust, steel boat was involved in the J Class event: she’s the ‘Motor Yacht’ acting as Mother Ship for Rainbow. After all, if I had the funds to commission and race Rainbow, I’d also probably insist that the 30 sweaty crew (remember, this is 1930’s racing) left me to enjoy the abject luxury of her staterooms with my friends and family, rather than some coffee-grinding (sorry, hemp hawser handling) gorilla. That is, if there’s 30 left after my helming (after all, there are no guard rails either). J Class replica ‘Rainbow’: 130′ of unashamed 1930s luxury racing for the Newspaper Magnates, Woolworth Proprietors and King George the V ths amongst us. A quick trip across the river in the water taxi, a turn around town to find a shower, drink and meal (entirely not in that order) from the extremely hospitable fellows and ladies of the Fowey Gallants Sailing Club, some table football, watching the china ships pass, chewing the cud with their old salts and admiring their Fowey River class sailing boats. Eventually, the three of us bundled out into the night to take the water taxi back to Krugerrand, in the now pouring rain, as the first hints of a gale began to churn up the water. The night was fairly sleepless: a Southerly gale (the harbour’s Achilles’ Heel) blew the swell straight up the Fowey River. The rigging creaked (or maybe that was Phil’s nocturnal ‘heavy breathing’) and we wished we had some forgiving nylon twist instead of polyester braid, because it was difficult to loosen the mooring lines enough to stop the wrenching crashes trying to jerk the fairleads out, as the waves tossed us to and fro. By the time it was light we had little sleep but, in various combinations of slackness and taught, now had a magnificent array of: two stern springs, a bow spring, breast line, a stern line and two bow lines. We were finally home in Cornwall and I’d at last made use of my collection of spare string (sorry Ollie: until it’s given a purpose – lanyard, spring, sheet, shore line, cunningham, halyard, rode or shoe lace – it’ll always just be string to me). This entry was posted in Passage and tagged eddystone lighthouse, gale, gallants, j class, marine engineer, mooring, rainbox, sail, yealm by admin. Bookmark the permalink.